Ryan Mitchell is a sculptor/painter and is a 2013-14 Resident artist at the Red Lodge Clay Center. Recently Ryan held the position of Resident Artist Director Of Da Wang Culture Highland, a center for the arts in Shenzhen, China. He received his MFA from the University of Montana in 2005. Ryan continued to reside in Missoula, Montana from 2005-2007 as a resident artist at The Clay Studio of Missoula. Since his years in Montana, Ryan has been selected for four different artist-in-residence programs. In 2007 he was a resident at Australia National University in Canberra. He participated as a resident artist at the LH Project in Joseph, Oregon in 2008 and 2009, and most currently in 2012. 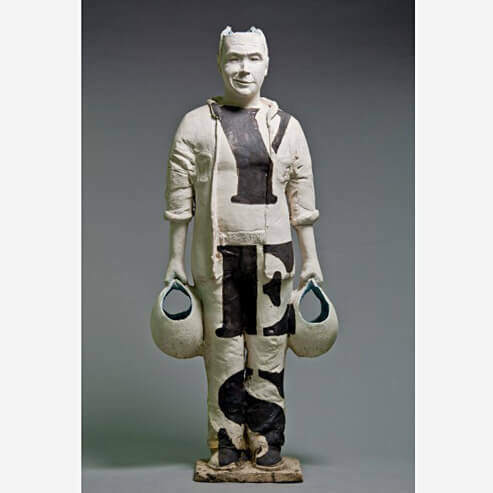 He was selected as one the first Americans to be an artist-in-resident at the FuLe International Ceramic Art Museums in Xi’An, China. Ryan was also a resident artist at The Northern Clay Center in Minneapolis (2010), receiving the 2010 McKnight mid-career residency fellowship. While working in Montana, Ryan designed/built kilns, instructed ceramic courses/workshops, and shared a passion for the development of ceramics in the west states; Ryan now extends his contributive spirit globally to make significant contributions to the Arts and Culture in China. Ryan has curated or been featured as an artist in 8 exhibitions and has arranged for more than forty international artists to visit and create their art in China. Ryan has been featured in solo exhibitions at the Holter Museum of Art (Helena, MT), Bentley Projects (Phoenix, AZ), Plinth gallery (Denver, CO) and Lill Street Art Center (Chicago, Il). He is represented by The Nevica Project and Art Spirit Gallery. I stay focused on one simple task of putting ambiguity and paradox between commonly held polar concepts like creation and destruction, artifice and artifact, past and present, symbolic and real, violence and care, part and whole, void and meaning, sincerity and irony, circumstance and intention. Despite its own contradiction and complexity my work is done with the single purpose of asserting that which shared.